Jessica Purdy teaches creative writing at Southern New Hampshire University. In 2014, she was nominated for Best New Poets and Best of the Net. She received her MFA in Creative Writing from Emerson College and now lives in Exeter, NH. Read one of Purdy’s poems, “At the Mica Mine: Grafton, New Hampshire,” here. Learn more about Purdy at www.jessicapurdy.com. I began writing poetry in seventh grade when we studied Shakespeare in English class, but that’s only part of the answer. I have to admit my other influences were from music lyrics, specifically Led Zeppelin, and later on, Joni Mitchell. So, I think it was not only the sound of words, but moreover the music of them that drew me in. Also, that I found myself identifying with some of Shakespeare’s characters and the themes in his plays. And that became the main reason I love all literature so much; that it connects with the reader on a universal level, but seems to speak to the individual at the same time. I have tried to write novels, but can’t seem to sustain them over time. I’ve written a lot of short stories, but poetry just comes to me more readily. It seems I can do things more easily in bite-size pieces. I’m inspired by so many things. Sometimes it will be a question one of my kids asks me that I find I can’t answer, so instead I write a poem as answer. My daughter once asked me what happened the first time it rained. Can anyone answer that? Well, I wrote a poem from that question that probably doesn’t answer it accurately, certainly not scientifically, but poetry allows you to create your own answers. I think that’s what I love about it the most, that freedom to express the inexpressible. Sometimes it’s something in nature that strikes the senses so powerfully that the imagery then leads to connection with things that are happening in my life. I’m also a visual artist, so I tend to see things in terms of color and movement, composition and form. What is the underlying structure of an object or of the human body that gives it form? I write a lot about the experience of painting. I have been doing a lot of ekphrastic poetry lately, which is the term used for poetry that confronts art in some way. Other times, words just appear in my mind and I let them roll out to see what they say. When I was in high school, I used to actually see words appear when my eyes were closed and it would be like watching the credits after a movie – a total surprise to me. Unfortunately this doesn’t happen as much anymore, but dreams do factor into my poems a lot. I have a whole book of dream poems. The subconscious is like a gift, I feel. How does your poetry come about; what’s the process like for you? I think I may have begun to answer this in the previous question, but the process is never the same. If the poem begins with something I’ve seen, usually the image sits with me for a while, as if I’ve filed it under “remember this one for when you’re writing.” A lot of times, if I just start writing the description of the image, then the connection to why it was important to me becomes clear. It’s the process of writing the image that becomes a meditation on meaning. If the poem comes from a dream, I usually just let the imagery stand on its own. Recently I saw the title of a child’s artwork that spoke to me somehow. It was: “I try try and again.” The child might have meant to say, “I try and try again,” but that mistake makes the cliched phrase so fascinating for me. I haven’t written a poem about it yet, but plan to. The other thing that makes the process different each time is the length of time I spend on a poem. Some can take years to revise and get right, while others come spilling out in a 45-minute session and feel done somehow. I find it challenging to write every day, and I don’t write every day. 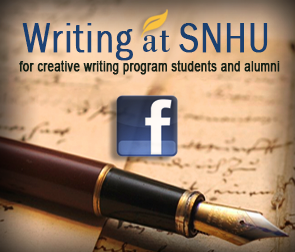 I have a family and I teach creative writing online here at SNHU. Often, I am doing things for others when I could be writing. This is the modern complaint, I guess. Some writers I know get up at four in the morning just so they can write before they do everything else in their day that they have to get done. I try not to write when my family is at home. I can’t tolerate being interrupted. For me, the writing usually has to come out fast before I lose it. But there will always be interruptions, distractions. My mind’s ability to file things away is something I really rely on. I keep a notebook in my purse that I jot ideas down in, or sometimes type things into my phone so I don’t lose them. Once I’m in front of the computer, I can go to those notes or those brain files and use them to generate a poem. Another important tool I use is connecting with other poets. I have two workshops that meet once a month. Having that deadline and accountability is extremely helpful in making me write. As a creative writing instructor, what are some of the commonalities that students struggle to master in their writing? If they’re writing poetry, it’s often the students desire to “sound poetic.” This could mean anything from using antique language or syntax to using metaphors that have been heard before. Mastering freshness in language I’d say would be the hardest thing for new students to poetry. The way to overcome this is to stay as close to honest as you can get. What are you actually seeing, as opposed to what you think you’re seeing? How is the way you’re seeing the thing different from the way someone else might see it? The best analogy I can give is it’s like when children draw pictures of the sun. Usually the sun is a yellow circle with lines sticking out of it. Is this the way the sun really looks? As the child grows into an artist, they see the sun as it really looks to them, not the way they think it’s supposed to look. In fact, the sun becomes something that paints the landscape with light. The artist doesn’t need to paint the sun itself. This is how we learn though. There is the concept of the thing, and then there is the way the artist sees it and expresses it that makes it unique. If they’re writing fiction, students can have difficulty keeping the tense consistent. I always tell them this is an indication that they are thinking deeply. When writing fiction, or creative non-fiction for that matter, it’s hard to express something that might be happening in the present when it’s already happened in the mind. The mind makes it seem like it’s already happened, hence the switch to the past tense. With non-fiction, the event has happened in the past, but writing in the present tense makes it more immediate. Still, writing about a memory that has happened in the past feels strange to write about in the present. Mastering tense takes lots of practice, and this mastery includes using tense as a tool for crafting a story, rather than just an incidental element. They can also struggle to create a “movie in the mind” of the reader. Readers can be trusted to make leaps, but not when there is no form underneath the action. Scenes should seem solid and active even when characters aren’t moving. Characters that seem alive and breathing make stories live and breathe. This is difficult to do. It takes effort to make this seem effortless. Always read the work that a journal publishes to see if your work fits the style they seem to like. Submit a lot. Keep trying. Read the guidelines. I used to read for a major literary journal and the volume of work received there was overwhelming. Readers are looking for any excuse to reject work. Make sure you proofread for errors. This shows that you care enough about your craft that you want to present your best work. If you get a personal rejection, take that as encouragement. Use Duotrope or Newpages.com to find journals. Duotrope requires a fee, but I find it’s worth it because of their submission tracker function. Anyway, I got my MFA from Emerson in 1997 and then moved from Boston to New Hampshire to have my first child. That was one of the biggest events of my life. I had moved away from my writing community and into this whole new territory: motherhood. It has taken a lot of time, but now that I’ve found the writing community here on the Seacoast (of N.H.) is thriving, I’m so bolstered by them. I’ve been submitting to journals regularly for the past 10 years or so and had several poems published in journals I respect. Honestly, the reason I have published my first chapbook is because one of my poet friends suggested I submit to a contest. Well, I didn’t win the contest, but the publisher, Finishing Line Press, wanted to publish my chapbook. This is what I mean by community. I just had a book launch party this past weekend. I shared the party with my friend who also has a chapbook coming out. This was our way of celebrating the books and getting the word out. There is this initial flurry of interest around a new book that you have to take advantage of. I have the book in the local bookstore. Sharing my news and events on Facebook and on my website are really important ways of marketing my book. I’m also trying to get it reviewed. This is a good way to direct people to books they might not hear about otherwise. I am doing several readings in the area, as well as down in Cambridge. On April 22nd, I read at the Kingston Community Library for their National Poetry Month event. I’ll be reading May 8th for an evening of poetry and fiction at the Word Barn, 66 Newfields Road in Exeter, NH. On June 5th, I’ll be reading for the Dire Literary Series at Out of the Blue Art Gallery, 541 Massachusetts Ave., in Cambridge, Ma. On September 16th, I will be reading at Gibson’s bookstore in Concord. There are too many to mention all of them, but I’d say the first that come to mind are Jane Kenyon and Elizabeth Bishop. I was introduced to Kenyon’s work just after she had passed away, when I was in graduate school. I found I identified so much with what she was writing about in her poems. The music of her words and her use of nature imagery influenced me a great deal and encouraged me to believe in my writing. Bishop’s work is so complex and rich; her detail so specific and genuine. I find her work mesmerizing.